Ebenezer Church parking plan with mechanized lift. 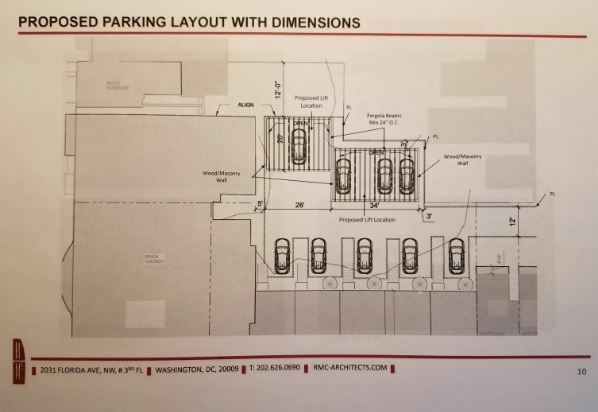 The developer for Ebenezer Church’s townhouse and associated parking plan has thrown in the towel on a proposed 16 car mechanized parking structure behind the Church. Instead, the developer will be back before the Historic Preservation Review Board (HPRB) on Thursday, with a new plan which anticipates a curb cut on 5th Street which will permit access to a proposed 16 space parking lot where the parking structures and five additional parking spaces had been planned. Under the new plan the developer says 16+/- cars could be parked. The old plan with the mechanized lift would have accommodated a total of 21. “Additional on-grade parking is proposed for the rear of the project. The developer chose to bring the altered concept back to HPRB without seeking input from ANC6B. On January 9, ANC6B opposed the original project by a vote of 4 – 2 – 2. In a letter to HPRB, the ANC noted that they found the project would contribute to a loss of historically significant green space within the square, that construction on the interior of a square without a public alley does not constitute ‘in-fill’ development in the way it is generally understood, and that the construction of a parking screen in a square without an alley is incongruous with the historic nature of the square. It would also have an adverse impact on the abutting neighbors which the Commission would prefer to prevent.” Presumably, the ANC’s opposition to the loss of green space would stand against the new plan as well. It’s likely an ANC6B representative will clarify the Commission’s position at the hearing. The Historic Preservation Review Board will meet on Thursday at 441 4th Street, NW in Room 220-South. 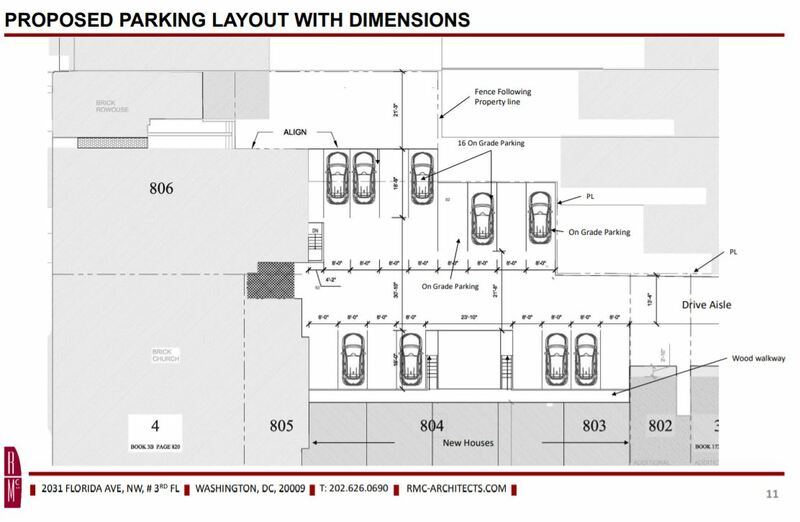 The parking proposal for Ebenezer Church (400-418 D Street SE, HPA 17-488, revised concept/construct parking structures) is scheduled for the 10:00am -10:45am time slot. Applicants and those interested in testifying should arrive at least fifteen minutes prior to the assigned time for the case. I looked on the map. It looks like a lot of trees would be cut down for this project. How many trees would be removed to build the townhouses? How many trees would be removed to make the new alley and parking spaces? Good questions to raise at the Thurs. hearing. What’s the acceptable number of trees that can be cut down for parking? No trees? Two trees per space? I’m not sure there is a precedence for this. The developer will need some guidance to judge what is acceptable to the neighborhood. The developer has lied about his plans throughout this process. Has no experience and can’t be trusted.